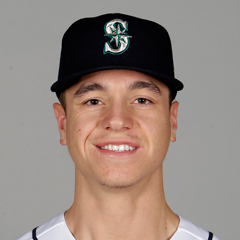 The St. Louis Cardinals made their first trade of the summer season, sending left handed pitching prospect Marco Gonzales to the Seattle Mariners for outfield prospect Tyler O’Neill. Both Gonzales, 25, and O’Neill, 22 were drafted by their respective teams in the 2013 draft. The Cardinals chose Gonzales in the first round, and O’Neill was the third round pick of Seattle. O’Neill was ranked in the top five of the Mariners prospects and becomes the No. 4 prospect for the Cardinals, according to MLB.com. The young outfielder was the Mariners Minor League Prospect of the Year in 2016, hitting .293 with 24 home runs and 102 RBI with the Double-A Jackson Generals. O’Neill has reported to the Memphis Redbirds. Gonzales had Tommy John surgery in 2016. The left hander will be out of options following this season and his future as a member of the big league pitching staff after 2017 was questionable, especially in the rotation. Gonzales, a former Gonzaga standout, makes his offseason home in the state of Washington, so the trade should be an easy transition for the Colorado native. In the first of a three game series, the Cardinals defeated the Mets thanks to a six-run sixth inning. The first scores came on a two run home run by Paul DeJong. An Adam Wainwright RBI double plated run number three. Tommy Pham then blasted a three run shot to left center field to give the Redbirds a lead they would not relinquish. Pham was 2-for-3 and Yadier Molina was 2-for-5. Wainwright earned his 11th win of the season. The veteran right hander pitched 5 2/3 innings, giving up three runs, two earned, on six hits. Wainwright fanned three and walked two. Tyler Lyons got the last out of the sixth inning. Matt Bowman pitched a scoreless seventh, and Kevin Siegrist added a scoreless eighth. Brett Cecil hurled a scoreless ninth to earn his first save. In the field, Magneuris Sierra committed two errors on the same play, a missed catch and a throwing error. Dexter Fowler also made a fielding error. The Redbirds blanked the Mets in the second game of the series in New York. Michael Wacha pitched the first complete game shutout of his career. The right hander allowed only three hits, struck out eight and walked one while winning his seventh game of the season. Matt Carpenter had a 4-for-5 offensive performance to go along with Wacha’s masterful pitching. Carpenter drove in one run on a second inning double. Jedd Gyorko put the first run on the board in the first inning on a sac fly. A second inning run scored on a Wacha ground out. Also in the second, a run crossed the plate on a fielding error. The fifth and final Redbird run came in the fifth on a Yadier Molina double. On the base paths, Tommy Pham stole his 13th base, but was also picked off first base. Gyorko stole his sixth. Shaky pitching from Mike Leake and unsteady defense put the Redbirds in the loss column in this third game of the series. Leake lasted only two innings, and gave up seven runs, four earned, on 10 hits. A throwing error on a potential double play by Jedd Gyorko exacerbated the situation. The efforts of the bullpen kept the Mets at seven runs. John Brebbia pitched three scoreless innings in relief. Kevin Siegrist, Sam Tuivailala, and Seung-Hwan Oh each tossed a scoreless inning. Leake was the losing pitcher, his eighth loss. The Redbirds offense managed three runs on 10 hits. Magneuris Sierra was 3-for-4 with two RBI. Luke Voit, pinch hitting for Matt Carpenter, drove in the other Cardinals run on a seventh inning double. Kolten Wong was 2-for-4. The Cardinals lost a tough one in the rubber game of the series. The Redbird bullpen couldn’t hold the Mets at the end. Starter Lance Lynn gave up only one run on three hits in his six-inning start. The righty fanned five and walked one. Matt Bowman followed with a scoreless seventh. Brett Cecil pitched the eighth, and gave up the tying run. Cecil was charged with a blown save. In the bottom of the ninth, Trevor Rosenthal was unable to send the game to extra innings, surrendering the walk off run with two outs when he did not cover first base on a chopper to first. The Cardinals offense was Tommy Pham. Pham drove in both runs, the first on an RBI double and the second on a solo home run. The only other Redbird with multiple hits was Greg Garcia, who was 2-for-4. Dexter Fowler was caught stealing for the third time this season. The Cardinals took advantage of a shaky Cubs bullpen and put nine runs on the board in the eighth inning to beat Chicago in the first game of the key weekend series at Wrigley Field. The game was close until the eighth. Randal Grichuk hit a second inning solo home run against Cubs starter Jake Arrieta to put the Redbirds on the board. An RBI double by Dexter Fowler in the third inning tied the game. By the eighth, with Arrieta out of the game, the Cardinals batted around against three Cubs relievers. Jedd Gyorko drew a bases loaded walk to plate the first run of the inning. Eight more runs crossed the plate on Paul DeJong ground rule double, a Grichuk single, a Carson Kelly double, and singles by Matt Carpenter and Tommy Pham. Carpenter was 2-for-5, Fowler was 3-for-4, and Pham and Grichuk were each 2-for-4. Starter Carlos Martinez pitched six innings, giving up three runs, two earned, on 10 hits. The right hander struck out three and walked one. Zach Duke and Matt Bowman combined for a scoreless seventh inning. Kevin Siegrist pitched a scoreless eighth. Seung-Hwan Oh allowed one unearned run in the ninth. Bowman was the winning pitcher. Game two of the series was a pitching duel until the eighth inning. Adam Wainwright went toe to toe with Cubs starter Jon Lester for seven innings, with neither team able to put a run on the board. Wainwright gave up the first run in the eighth on a single and a double. With two outs and a runner on, Matt Bowman took over. The reliever allowed an inherited runner to score, and left without recording an out and his own runner on base. Brett Cecil allowed the Bowman runner to score then got the final out of the inning. Wainwright pitched 7 2/3 innings and gave up two runs on four hits. Bowman was charged with the blown save and the loss. Both Cardinals runs came in the eighth inning on back to back solo home runs by Paul DeJong and Randal Grichuk. There were only three Redbird hits, with the other hit a Wainwright single. Gyorko committed his ninth error of the season, a throwing error. Yadier Molina had a passed ball. The Cardinals lost the rubber game and the series on Sunday night. St. Louis got on the board first with a two run home run by Randal Grichuk in the second inning. The Cubs came back and tied it up with two runs in the bottom of the third. The Cardinals took the lead back in the fourth on solo home run by Paul DeJong. Grichuk and DeJong were 2-for-4 as was Jedd Gyorko. Starter Michael Wacha pitched six innings, giving up five runs on six hits while fanning six and walking none. Wacha suffered his fourth loss of the season. Seung-Hwan Oh pitched a scoreless seventh and Tyler Lyons pitched a scoreless eighth. Yadier Molina was caught stealing in the fourth, just prior to DeJong’s home run. Matt Carpenter was thrown out at home plate and left the game due to injury. The Cardinals ended the week 3-4. Other than the poor start by Mike Leake against the Mets on Wednesday, the starting pitching has been good. The bullpen has been hit and miss. The offense has been inconsistent as well. Defensive errors and baserunning blunders have picked up lately, serious issues for the Cardinals both this season and last. As the trade deadline approaches, the Cardinals will have a difficult decision to make. Will they be buyers or sellers or both? The team’s performance this week has not answered that question. The Cardinals are now 47-51, which puts them 4.5 games back of first place in the NL Central and in fourth place. With the Brewers faltering, the Cubs have moved into a share of the division lead and are rumored to be considering further trades, in addition to Jose Quintana, the Cubs’ winning pitcher in the deciding game of the series Sunday night. Tommy Pham is batting .276 with an OPS of .915. He has 2 HR, 2 doubles, and 7 RBI. Adam Wainwright has an ERA of 2.70 and a WHIP of 0.90. Lance Lynn has an ERA of 1.50 and a WHIP of 0.67. Kevin Siegrist has an ERA of 0.00 and a WHIP of 0.67. John Brebbia has an ERA of 0.00 and a WHIP of 0.33. 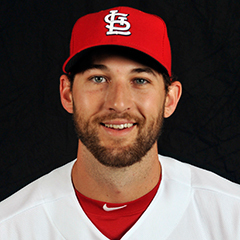 Michael Wacha has an ERA of 0.00 and a WHIP of 0.44. Jedd Gyorko is batting .115 with an OPS of .315. Paul DeJong is batting .167 with an OPS of .633. Luke Voit is batting .100 with an OPS of .508. Mike Leake has an ERA of 18.00 and a WHIP of 5.50. Brett Cecil has an ERA of 9.00 and a WHIP of 2.67. Trevor Rosenthal has an ERA of 5.40 and a WHIP of 1.80. The leadoff hitter has been Matt Carpenter. The number 2 hitter has been Tommy Pham. The number 3 hitter has been Dexter Fowler. The number 4 hitter has been Jedd Gyorko for six games and Luke Voit for one game. The number 5 hitter has been Yadier Molina for five games and Paul DeJong for two games. The number 6 hitter has been DeJong for three games, Kolten Wong for two games, Magneuris Sierra for one game, and Voit for one game. The number 7 hitter has been Wong for three games, DeJong for two games, Randal Grichuk for one game, and Greg Garcia for one game. The number 8 hitter has been Sierra for four games, Eric Fryer for one game, Carson Kelly for one game, and Grichuk for one game. 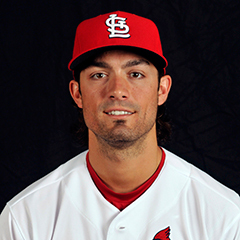 7/19 The Cardinals sent OF Randal Grichuk on a rehab assignment to the Springfield Cardinals. 7/21 The Cardinals activated OF Randal Grichuk from the 10 day disabled list. 7/21 The Cardinals activated LHP Zach Duke from the 60 day disabled list. 7/21 The Cardinals designated C Eric Fryer for assignment. 7/21 The Cardinals optioned RHP Sam Tuivailala to the Memphis Redbirds. 7/21 The Cardinals optioned OF Magneuris Sierra to the Springfield Cardinals. 7/21 The Cardinals traded LHP Marco Gonzales to the Seattle Mariners for OF Tyler O’Neill. 7/21 The Cardinals recalled C Carson Kelly from the Memphis Redbirds. OF Stephen Piscotty (right groin strain) is still feeling discomfort. No timetable for his return to the roster from the 10-day DL has been indicated. 1B Matt Carpenter left Sunday night’s game with right quadriceps tightness. It is unclear whether a trip to the disabled list is in the offing. P Mike Leake continues to experience weakness during his starts, but there are no plans to skip his turn in the rotation for additional rest. It is unknown whether the problem is related to his case of shingles late last season. Following the Sunday game in Chicago, the Cardinals traveled home to St. Louis to begin a three game series with the Rockies. Mike Leake is scheduled to make the Monday start, followed by Lance Lynn on Tuesday, and Carlos Martinez on Wednesday. The home stand continues on Thursday with a four game series against the Diamondbacks. No pitchers have been announced for that series, but will likely be Adam Wainwright, Michael Wacha, Mike Leake, and Lance Lynn. The Cardinals will have an off day next Monday to travel to Milwaukee to take on the Brewers in a three game series starting Tuesday. The team then travels to Cincinnati for a weekend series against the Reds. The Cardinals fly to Kansas City following the Reds series to being a four game home and home series with the Royals starting on Monday, August 7. The Redbirds play two games in Kansas City, followed by two games in St. Louis. Matt Adams and the Atlanta Braves travel to St. Louis for a weekend series following the home and home series with the Royals. The Cardinals’ regular season schedule can be found here. In Friday’s game against the Cubs, the Cardinals scored nine runs in the eighth inning to defeat the Cubs 11-4. Those nine runs are the most runs scored by St. Louis in a single inning this season. Those nine runs are not the team record, however. It is 12 runs, accomplished twice. Fans may remember one of these two games, as it was in the very recent past, five years to the day, on July 21, 2012. The team they scored the 12 runs against was the same, the Cubs. Those runs were scored in the seventh inning in 2012, as opposed to the eighth on Friday. Those 12 runs were scored against four Cubs relief pitchers. The Cardinals scored their nine runs on Friday against 3 Cubs relievers. The other game in which the Cardinals scored 12 runs in an inning was not recent. It was on September 16, 1926, in the first game of a doubleheader against the Phillies. The runs were scored in the third inning of a game that the Cardinals won 23-3. Six of the 12 runs were scored against the Cubs starter, Jack Knight. The remaining six runs were scored against three Cubs relievers, none of whom recorded an out. There is no inning by inning breakdown, but the Cardinals hits totaled 22, with five doubles and 17 singles. Left fielder Chick Hafey drove in five runs, first baseman Jim Bottomley had four RBI, and third baseman Les Bell plated two. The 1926 St. Louis Cardinals finished the season with a record of 89-65, which won the NL pennant for them. The Cardinals then went on to win the World Series four games to three over the vaunted New York Yankees of Ruth and Gehrig. The 1926 Cardinals were managed by Rogers Hornsby. Another fact of note is that St. Louis’ staring right fielder in the September 16 game was Billy Southworth. The future Hall of Famer went on to manage the Cardinals twice. The first time was three years after that season, in 1929. Southworth then returned to manage the Cardinals from 1940-1945, a period when the Cardinals won two more World Series Championships, in 1942 and 1944. 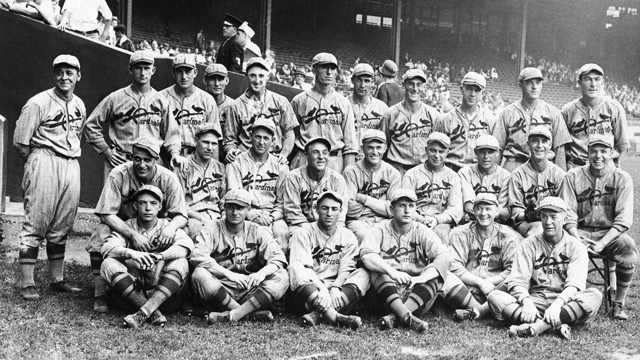 The 1943 Cardinals also went to the World Series, but lost to the Yankees, whom they had defeated in the World Series in the previous year.